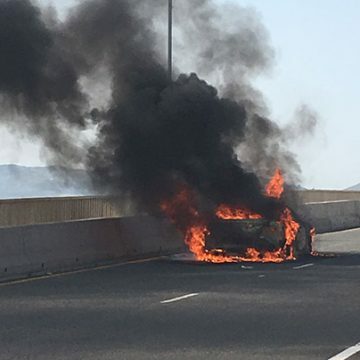 Vehicle Fire Investigations are conducted for various clients, including Private Individuals, Transport Companies, Insurance Companies and Motor Vehicle Manufacturers. We examine vehicles in detail to determine the specific cause of the fire. The specific cause of a fire can relate to many variables, but the basic principles of the cause of the fires remains similar. Firstly there must be a fuel that can oxidise in the right circumstances. The fuel may refer to any agent that can oxidise in an exothermic chemical chain reaction. Fuels could therefore refer to petrol (gasoline), diesel, oil, or the insulation materials around wiring or other flammable materials that form part of the vehicle. It may even include the application of an external accelerant in cases where vehicles were purposely set on fire. The “right circumstances” simplified, refers to the presence of oxygen and heat in the right amounts relative to the fuel. Heat, which is the most common characteristic of a fire, is also required to ignite or initiate the process of burning and the heat released during the burning process (the chain reaction) sustains the fire. The oxygen is required for the oxidisation process that occurs in a chain reaction. We therefore also refer to the “Fire Triangle” and the “Fire Tetrahedron” respectively, where the fire Triangle refers to (1) Fuel, (2) Oxygen and (3) Heat. When we add (4) the chain reaction, it is referred to as the “Fire Tetrahedron”.